Kurt Tank, technical director of Focke-Wulf Flugzeugbau (aircraft factory) at Bremen, was invited to propose a new fighter design to the German Air Technische Amt (technical dept) in April 1938, not because there was any urgency but because a second type to back up the Bf 109 was deemed prudent. Tank personally convinced the officials of the suitability of using a large air-cooled radial engine, one major factor being the existence of the BMW 139, promising powers well beyond the capacity of the leading liquid-cooled units, the DB 601 and Jumo 211. Focke-Wulf was awarded an order for three prototype Fw 190 V-series (Versuchs) or trial aircraft in June 1938. Tank himself sketched the original basic configuration, a shape reminiscent of the Hughes racer with a very small wing, slim body, and extremely tall, wide-track landing gears. Detailed engineering design was headed by R Blaser who imprinted his brilliance on every part of the aircraft. The only obvious shortcoming was that the close-coupled engine and cockpit precluded fuselage armament, and also risked unbearably high cockpit temperatures, and the latter were borne out on the first flight on June 1, 1939. But by this time BMW had succeeded in getting permission to drop the BMW 139 in favour of a more advanced radial, the BMW801. This was of slightly larger swept volume, and though heavier and longer than the 139 promised eventually to yield some 2000 hp. The Fw 190 was therefore grossly reengineered to take the new engine. In June 1939 it was decided to fly the Fw 190 V2 with the original engine, scrap the next two aircraft in an agreed pre-production batch of 40, and build the V5 as a BMW 801-powered machine with a different forward fuselage. Early flight trials with Fw 190 V I showed superb handling, but the advanced engine installation with ducted VDM propeller spinner lacked the ten-blade cooling fan and this overheated the engine as well as the cockpit. With the V2, flown on October 31, 1939, two MG 17 machine-guns were added to the wing roots, and the engine installation eventually had the cooling fan geared up from the propeller shaft, plus a normal air inlet flowing around a small spinner. Much larger changes were seen in V5, flown in April 1940, which apart from the definitive BMW 801 engine had a restressed airframe for considerably increased weights, a smaller and rearranged cockpit moved considerably further back over the trailing edge of the wing, changed main landing gears raked sharply forward with the wheels housed in swept-forward wing roots (with fairing doors moved from the legs to the belly) and several other alterations. An advantage of moving the cockpit back was that guns could be installed in the top decking, but the view for taxiing was made worse than before, though it was still acceptable. An even more fundamental factor was that the bigger engine, and other changes, had substantially raised the weight; in fact the Fw 190 was ever afterward generally heavier than either a Bf 109 or a Merlin-Spitfire though it was exceptionally small and compact. Tank decided as early as May 1939 to increase the size of the wing, which had always been more appropriate to a racer than a dogfighter. In about October 1940 this wing, with area raised from 16 to 18.3 sq m (161 to 197 sq ft) was flown on V5, and became standard. The Fw 190A-0 pre-production batch that followed had the 1600-hp BMW 801C engine and four 7.92-mm (0.312-in) MG 17 machine-guns. Deliveries to Rechlin and other test centres began in February 1941, and II/JG 26 (a wing of the group selected to be first with the new fighter) assisted in unearthing problems and refining operational procedures. Focke-Wulf had named the new fighter Die Wurger (shrike, or butcher-bird), but this did not catch on. But its outstanding qualities led to urgency in getting it into production, and while Focke-Wulf established a production line at Marienburg, Arado at Warnernfinde and Ago at Oschersleben also tooled-up for production. But initial operational evaluation by II/JG 26 at Le Bourget (Paris) and Maldeghem (Belgium) was a disaster, hardly any flight being completed without overheating and engine-seizure and most not even getting airborne. An official investigation recommended that the Fw 190 should be cancelled; but all that was needed was more cooperative effort between Focke-Wulf and BMW. Within a month the situation was dramatically improved. The FW 190 V18 was designed and built as a prototype for the high-altitude FW 190 C, and in V18/U1 form it had the DB 603 A engine driving a four-bladed propeller. The FW 190 C was a projected high-altitude fighter that never came to fruition; even so five prototypes were completed, the FW 190 V18, V29, V30, V32 and V33. Each of these aircraft had DB 603 inline engines, annular radiators, Hirth 9-2281 turbochargers and four-bladed propellers. The FW 190 V18 was coded CF + OY and received a white outline Balkenkreuz and Hakenkreuz. By 1944 the project had been halted by technical problems and opposition to use of the DB 603 (which was needed for other aircraft types). The FW 190C prototypes went on to be modified and used as prototypes for the Ta 152 H.
Delivery of the four-MG 17 Fw 190A-1 was followed by the A-2 from Arado in August 194 1. Many A-1 were given two 20-mm (0.79-in) MG FF cannon outboard of the landing gear, most as a modification, while the A-2 had two of the new 20-mm (0.79-in) Mauser MG 151 cannon instead of MG 17s in the wing roots. This formidable armament com-bined with outstanding all-round perform-ance and manoeuvrability to make the 190 the greatest air-superiority aircraft in the sky in 1941. One of its first major actions, with JG 26, was air cover for Scharnhorst, Gneiseprau and other ships on February 12, 1942. JG 26 annihilated 825 Squadron's Swordfish. Against the Spitfire V it established immediate supremacy, the British fighter being outclassed in every respect except turn radius, where the rivals were closely comparable. But the early-model Fw 190 gave the RAF the largest combat shock in its entire history. The superiority of the German fighter was accen-tuated by the fact that it was virtually unknown even though it had been flying well before the war. When the first Fw 190A-1s of 6/JG 26 clashed with Spitfires on 27 September 1941, it was realized that the new German fighter had the advantage both in speed and manoeuvrability. By 1942 production was centred on the A-3, with many changes and introducing the first of a fantastic variety of external armament options which made the Fw 190 the most versatile fighter of the war. Later, on June 23, 1942, Oberleutnant Arnim Faber, adjutant of III/JG 2, achieved an unsought place in history by mistaking his bearings in a dogfight over the Bristol Channel and making a perfect landing at RAF Pembrey in South Wales, thereby giving the RAF what was probably its most welcome prize and enabling a thorough and sobering flight evaluation to be made. Dissecting the Fw 190 if anything increased the respect in which it was held. Likewise on the Eastern Front a growing force of Focke-Wulfs battled with Soviet fighters and soon became highly regarded. In fact, the Fw 190 was not exactly small and light in the Soviet style, but compact; it seldom turned the scales at under 4000 kg (8800 lb) and nearly all had a laden weight of around 4900 kg (10800 lb), much of which was accounted for by the heavy armament, equipment, armour and external tanks or ordnance. In the summer of 1942 the A-4 introduced methanol/water (MW 50) injection for brief bursts of power up to 2100 hp, and new radio resulted in a changed aerial mast on the fin. One subtype, the A4/R6 (R being the suffix for field-modification kits), was first to carry the 21-cm (8.27-in) WGr 21 rocket tubes which did more than anything else to break up the B-17 formation of the disastrous first raid on Schweinfurt on October 14, 1943. The American target had been a ball-bearing works, and precisely six months earlier a British ball-bearing factory at Chelmsford had been destroyed by Jabo (fighter/bomber) Fw 190A4/U8 aircraft of SKG 10, each racing in at low level with four SC50 or one SC250 in one of the more damaging of hundreds of 'tip and run' attacks by the nimble Fw 190 on southern England. So successful was the Jabo 190 that special versions were developed for this duty, and these gradually supplanted the Ju 87 and all other Luftwaffe attack aircraft for almost every kind of battlefield mission. Very small numbers (for example, five of the A-5/U2) were built as night fighters, and used by Major Hajo Herrmann's famed Wilde Sau free-ranging JG 300 wing, followed by JG 301 and 302, but suffered high attrition in brief careers. By 1943 the variations numerous, but new armament included the 13-mm (0.51-in) MC 131 in the top decking of the fuselage (making a shallow bulge from windscreen to engine) and various wing arrangements of 20-mm (0.79-in) and 30-mm (1.18-in) cannon. From the A-5 the length was increased, and the most numerous of all Fw 190 versions, the A-8, even included a tandem trainer version, supplemented by the Fw 190S series high-speed communications transport. Other new features included turbo-charged engines, various reconnaissance installations, Doppelreiter overwing drop tanks, torpedoes, spin-stabilized rockets, recoilless guns (firing horizontally or almost vertically), heavy underwing cannon, the X-4 wire-guided air-to-air missile and armoured leading edges for ramming. Two important families placed in produc-tion in early 1943 were the F-series Schlachtflugzeug (tactical attack and close-support) and G-series Jabo-Rei (long-range bomber). By the end of 1943 these were the most important Luftwaffe attack aircraft in Italy and on the Soviet front, progressively re-equipping all except one of the former Stukagruppen and carrying out every kind of front-line sortie as well as providing for air-superiority fighting (a task for which the under-gunned G was not suited). On the Eastern Front a variety of special weapon installations were tested against armour, including the Zellendusche SG 116 (three 30mm [1.18-in barrels), HF/15 (five 15-mm [0.59-in barrels under each wing), Panzerschreck 88-mm (3.46-in) rockets, Panzerblitz (eight longer-range rockets), WGr 28 (special hollow-charge rockets) and Forster-sonde SG 113A, consisting.of two pairs of 77-mm (3.03-in) recoilless guns mounted vertically in the wings, triggered by a tank's magnetic field. Other late-war installations included the Kurt SB 800RS roller-drum bomb, Hagelkorn (Hailstone) Bv 246 guided glide-bomb with slender concrete-coated wings, and the various BT (Bomben-Torpedo) antishipping weapons. None of these saw as much action as the various bombs of weights seemingly fantastic for so small a fighter, which included the Luftwaffe's largest conventional weapon, the SC 1800 of 1800 kg (3970 lb). No other fighter of the Second World War went into action with such massive weapons, and the SC 1800 needed special tires, and a long takeoff. On March 7, 1945, NSG 20 (night attack wing) used SC 1800 bombs against the vital Remagen bridge. 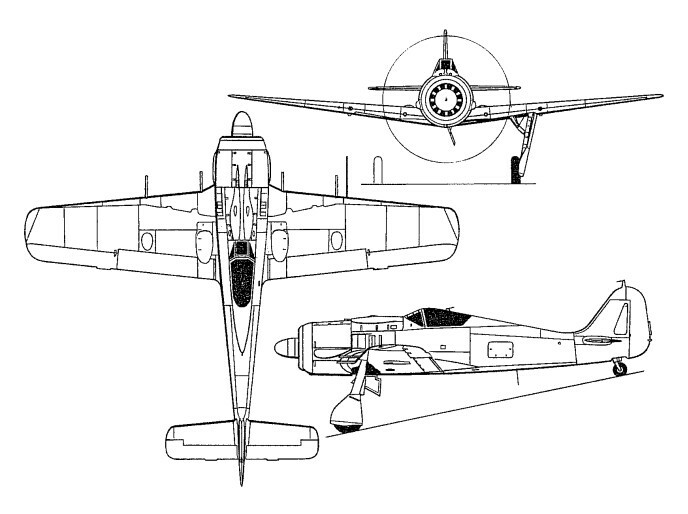 Various Fw 190s, including the A-8 and F-8, were used as the piloted upper component of Mistel composite attack aircraft. In 1941 Tank and the air ministry had discussed ways of improving high-altitude performance. Tank pushed use of the liquid-cooled DB 603 (an engine developed after the 190 was designed), and in 1942-43 numerous prototypes flew with this engine, nearly all having circular ring-cowls and the coolant radiator variously under the engine or under the rear fuselage. Many had pressure cabins, and the majority a four-bladed propeller with broad blades. Rather gradually a vast experi-ence of extremely fast high-altitude flight was built up which, via the Fw 190B and C series, resulted in the definitive model, the long-nosed Fw 190D ('Dora'). The engine was not to be the Daimler-Benz at all, but the fast-revving Jumo 213, the A-1 version of which was rated at 1776 hp (2240 with MW 50 injection) and could deliver 1880 hp at 4750 m (15500 ft) and almost twice the power of the original 1939 BMW radial at twice this altitude. To counter the length of the nose, an extra section was added to the rear fuselage, and in all production D-versions the area of the fin and rudder was increased. Most examples had a bulged canopy giving better rear view. The Fw 190D-9 began to roll off Focke-Wulf's Cottbus assembly line in quantity in August 1944, and the pilots of III Gruppe of Jagdgeschwader 54, which was the first unit to fully equip with the fighter on which it achieved operational status during October. From August 1944, 1805 D-9s were built. Though only slightly faster than earlier Fw 190s at medium altitudes, and certainly no more manoeuvrable, the Dora 9 was faster in the climb or dive and significantly better at altitudes above 8000 m (26 250 ft). Most were comparatively lightly armed, with two MG 151 and two MG 131, plus an SC500 bomb or tank, and only about 700 had been completed when the Allied advance progressively over-ran the vast complex of Fw 190 production factories. Right to the end, production of the radial-engined aircraft was on a much greater scale, the output of the F and G rising to unprecedented levels in 1944 and outstripping the Dora 9 by a factor of roughly ten to one. Total production of all versions is impossible to give with precision, especially as Albert Speer's ministry added in the totals of air-craft incorporating fuselages or wings from machines previously counted but damaged by bombing of the factories before completion. A good guess for aircraft delivered to the Luftwaffe is 19 600, while Focke-Wulf's figure for overall production of all versions, including the great diversity of prototypes, is 20001. This does not include the Ta 152 but it does include the many intermediate aircraft that led to it in 1942-43. Although the company manufactured a prototype two-seat Fw190 to help with the conversion of pilots from slower ground attack units, all the other two-seaters were produced by modifying existing aircraft. 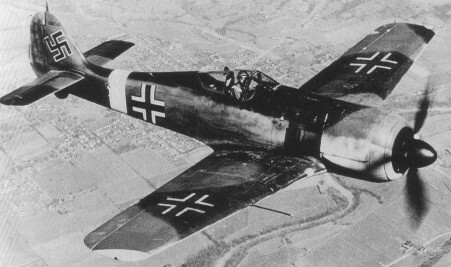 Though manufacture of the Fw 190 was naturally halted by capture of the German factories, which by 1944 extended through-out Germany, Czechoslovakia, Austria and, especially, Poland, there remained a network of plants in France that saw in the 190 a useful stop-gap fighter for their own Armee de l'Air. Most of the French factories involved were nationalized into SNCAC or SNCASO, the assembly line being at the SNCAC underground plant at Cravant, near Auxerre. When liberated, the Fw 190A3 was on the line, and after a slight hiccup this continued in low-rate production with the French designation NC 900. Later in 1944 the A-8 was substituted and some 64 NC 900 fighter/bombers were delivered by 1946. They equipped Armee de l’Air GC III/5 Normandie-Niemen, but were not popular. Other users of the Fw 190 included the Spanish Blue Division on the Eastern Front, the Turkish air force and Argentina. Engine: BMW 801D-2, 1700 hp. Length: 8.8 m (28 ft 10.5 in). Wing area: 196.98 sq.ft. (18.30sq.m). Gross weight: 10,800 lb (4,900 kg). Max speed: (clean, override boost, typical) 673 km/h (418 mph). Max range (clean): 497 miles (800km). Armament: Four 20-mm cannon in wings, two 13-mm machine-guns in fuselage; various underwing or under-fuselage loads of small bombs. Length: 8.95 m (29ft 4.5 in). Maximum speed: (clean, override boost, typical) 673 km/h (418 mph). Gross weight: (typical) 4900 kg (10800 lb). Max TO wt: 10,670 lb (4850 kg). Max level speed: 426 mph (685 kph). Gross weight: 4900 kg (10800 lb). Engine One 1,700 hp BMW 801 D.
Gross weight: G-1 with SC1800; 6300 kg (13900 lb). Armament 2 x 7.9mm machine-guns 4 x 20 mm. cannon. Max speed 408 mph (655 kph). Ceiling 37,400 ft. (11,400 m.) fully loaded.